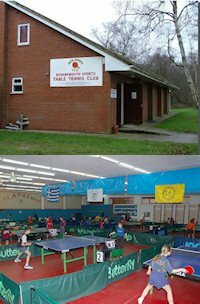 The Abilene Kansas Table Tennis Club, USA, welcomes all visitors of any level of play. All play for free at our club! We meet at the Abilene Community Center 1020 W 8th St, Abilene, Kansas and play Wednesday evening from 6pm to 9pm. We can arrange to have the club open other times if asked and the room is available. We can set up as many as 10 tables for our tournaments but usually only need 3 for most evenings. We have from 4 - 8 regular players and play singles and doubles getting everyone involved. Two of our members have completed USATT or ITTF coaching clinics and offer free coaching to players wanting help. Most of our players are seniors and include three who have medaled at National Senior Games and Huntsman Senior Games. All ages and abilities are welcome. Tables are Butterfly, balls are provided, club paddles are available if you don't have yours with you. We have a robot that we can set up for your practice. Our tables will be completely surrounded by barriers so there is minimal interference from other tables. We KNOW we have the friendliest group of players and welcome all visitors. We are conveniently located only one mile off Interstate 70 and will arrange to play most anytime as at least 4 of us are retired and will meet you there if you are traveling through Kansas and let us know you are coming!